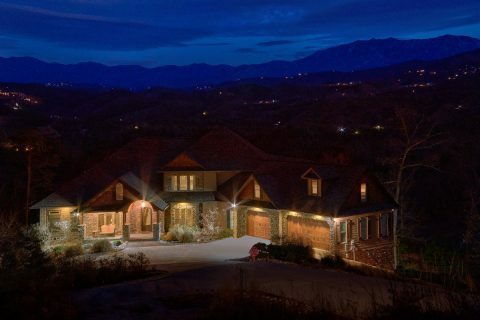 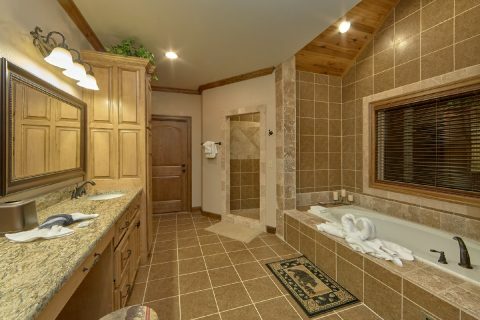 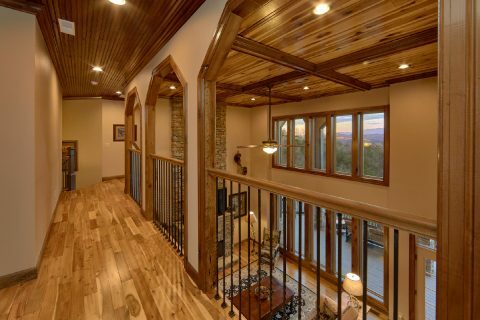 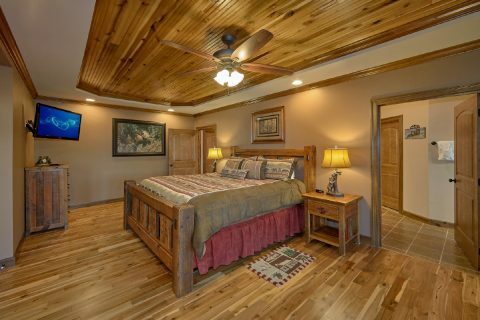 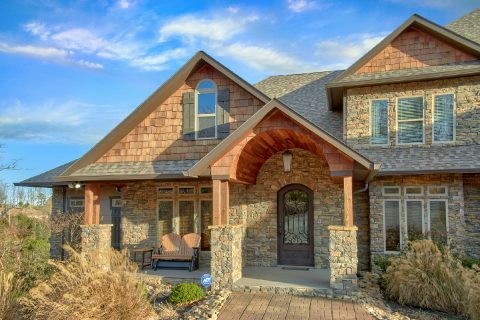 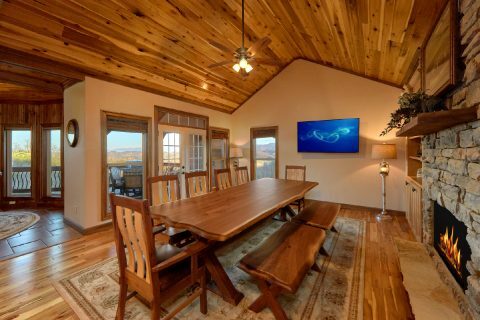 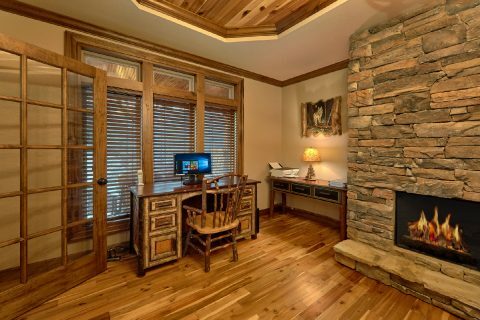 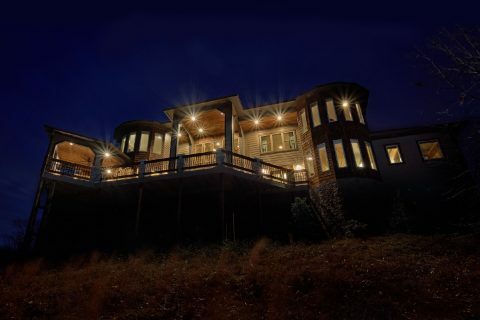 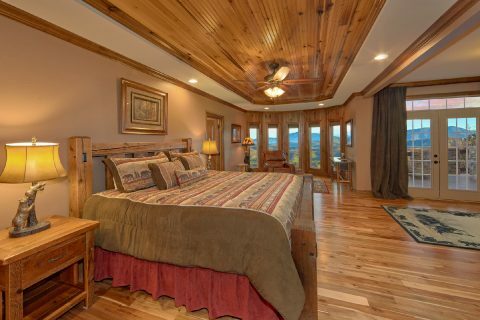 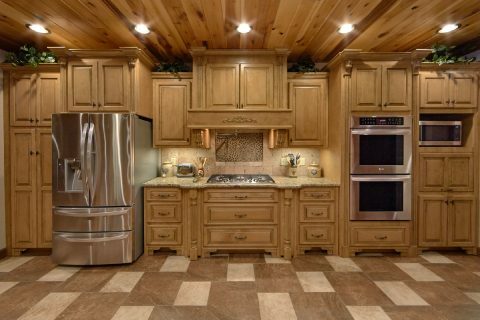 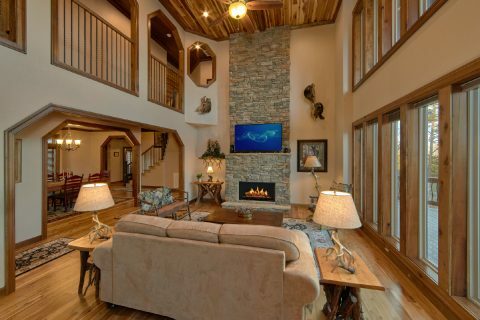 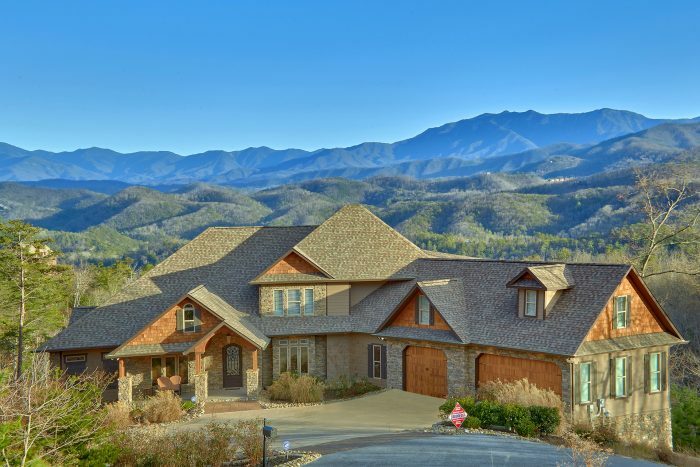 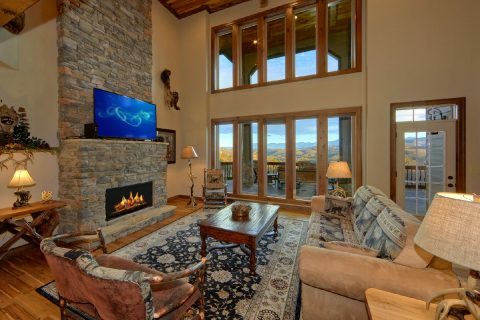 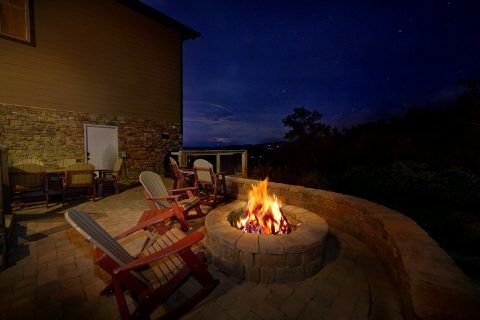 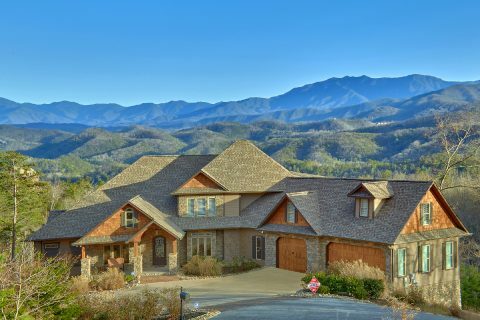 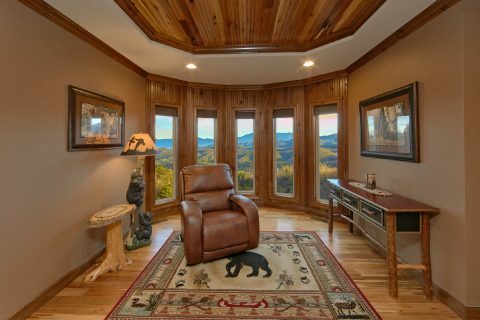 "Bluff Mountain Lodge" is an impressive 6 bedroom luxury rental in the Smokies that's ideal for group vacations. 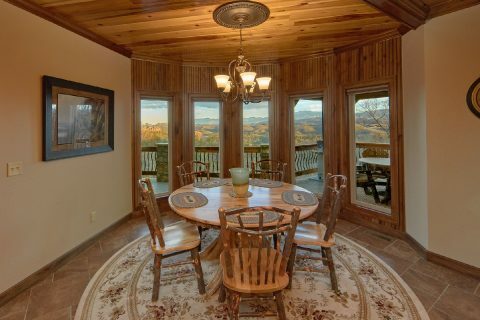 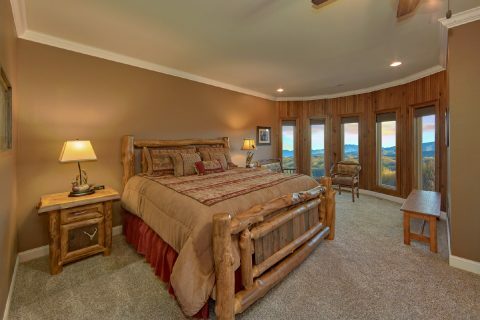 After all, this lovely mountain villa near Pigeon Forge and Wears Valley offers 6 bedrooms and room for up to 20 guests. 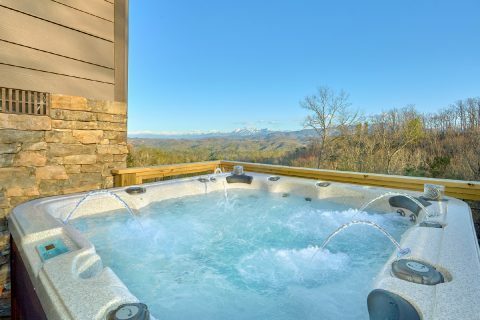 With a great location that's only 7 miles from the Pigeon Forge Parkway, this Wears Valley area lodge is ideal for enjoying top local attractions and the beautiful natural scenery of the Smokies. 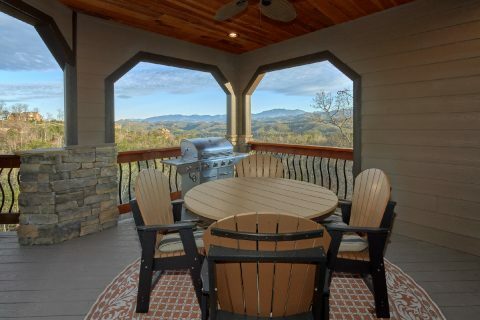 From this rental's deck, you'll enjoy mountain views that go on for miles and miles. 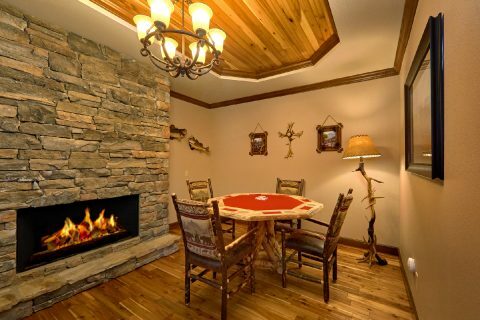 Inside the main level, you'll find 3 stacked stone gas fireplaces that make this area truly comfortable and inviting. 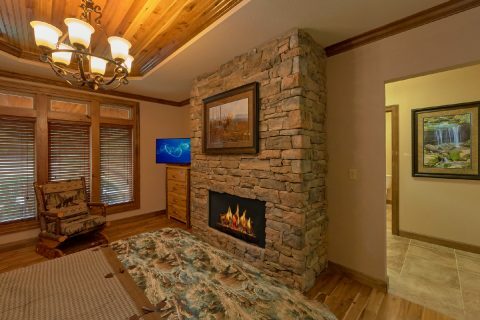 In the main living area, you can enjoy relaxing by the fireside while you enjoy a movie on your rental's flat-screen television. 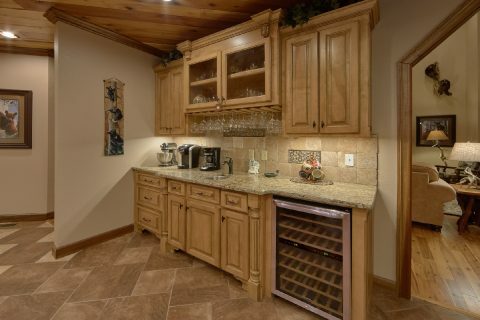 Nearby, you can prepare excellent meals in the fully equipped kitchen that comes with a double oven, a large pantry, and a 2nd sink area with a wine fridge. 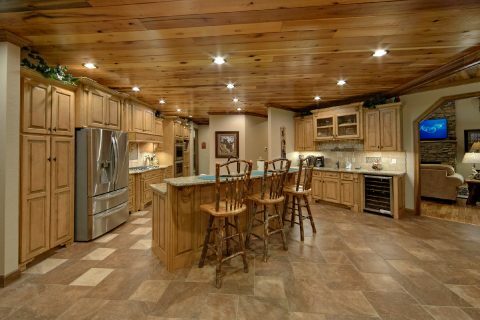 This luxury lodge also comes with a gas grill for cooking delicious meals in the great outdoors. 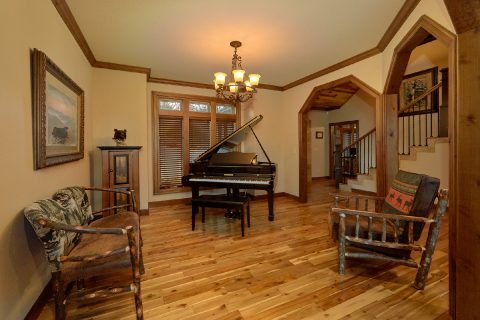 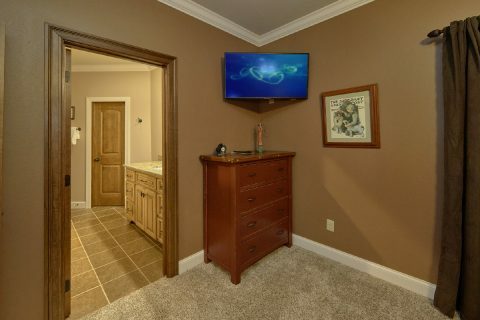 Additionally, this floor offers a queen bedroom that features a chest of drawers, TV, chair, and stone fireplace. 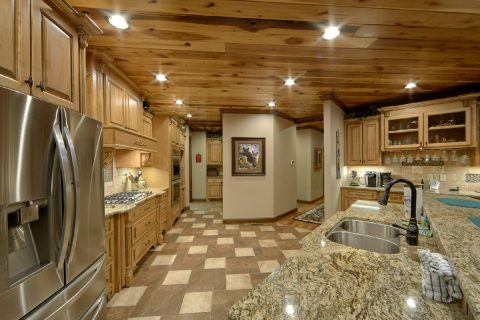 There is also an office area just off the kitchen on this level as well. 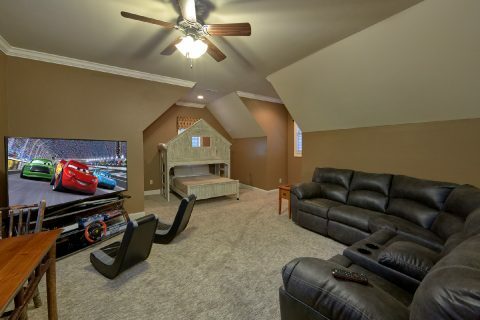 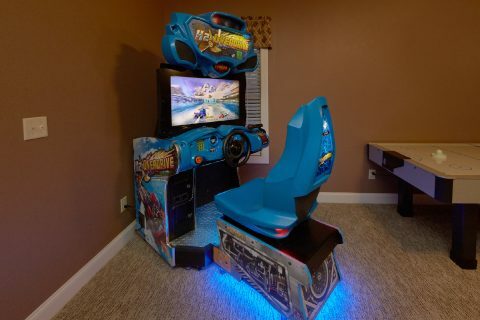 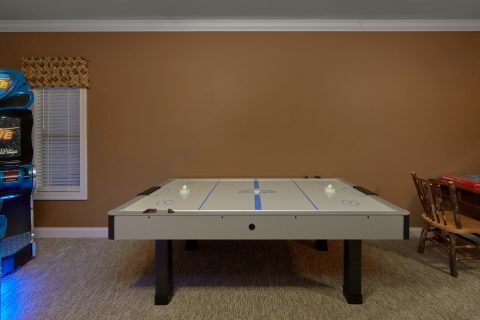 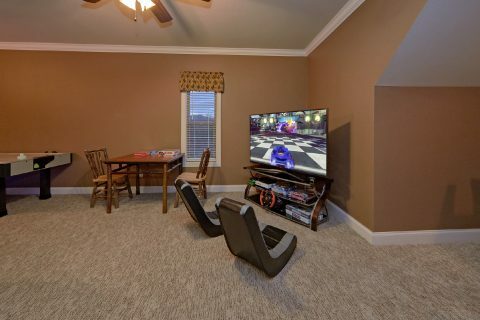 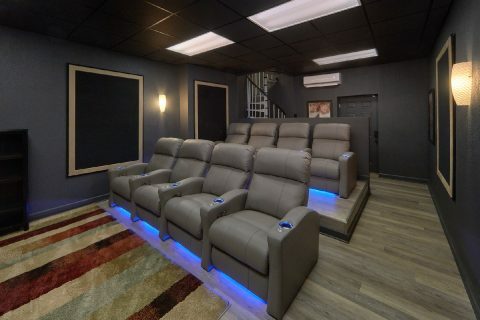 For at-home entertainment, you'll have a blast playing fun games in the upstairs game area that comes with a television area, mini-fridge, an air hockey game, a race car driving game and a sit down multicade arcade game. 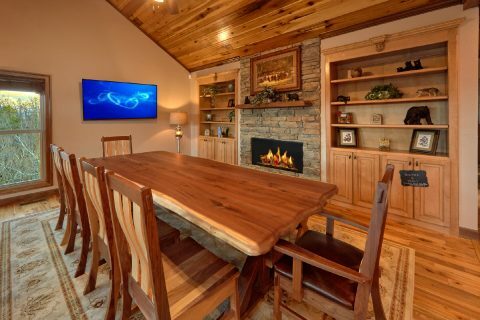 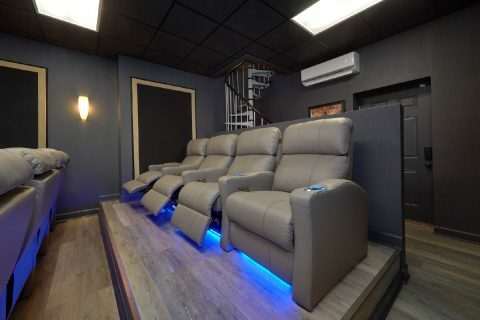 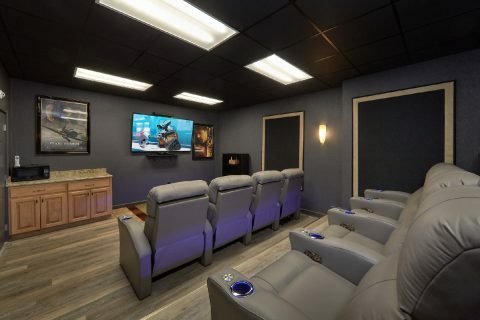 The lower level of this cabin also features a theater room that boasts an 80-inch screen and leather power recliners that are perfect for enjoying the big game in style and comfort. 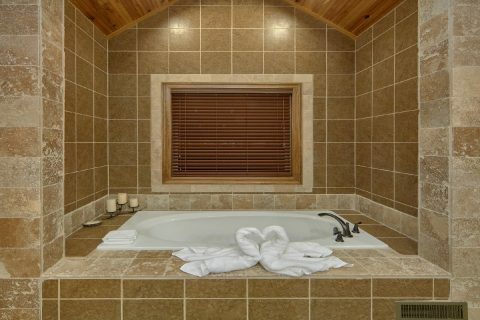 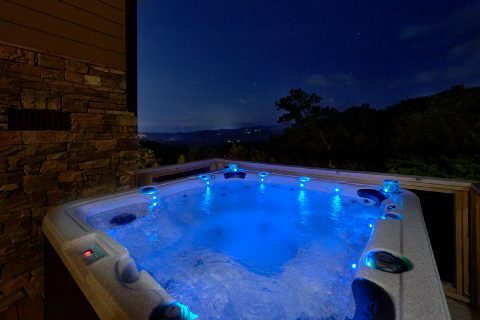 For even more relaxation, step outside onto the back patio area to enjoy your cabin's large hot tub that features dozens of jets, blue tooth speakers, and LED lights. 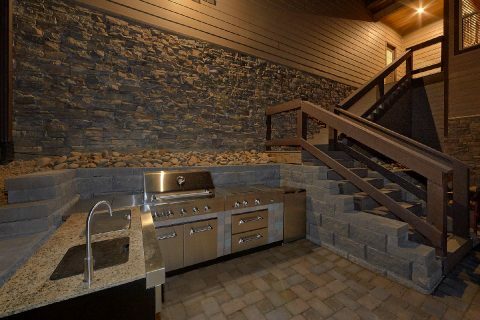 There's also an outdoor fire pit and a kitchen area complete with a grill and a sink to use during your stay! 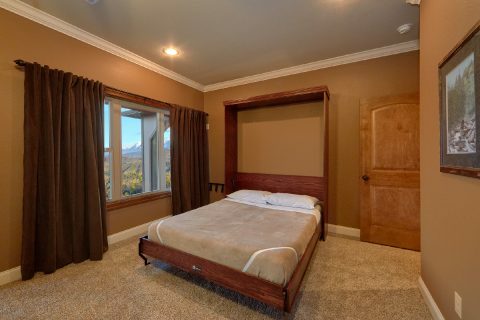 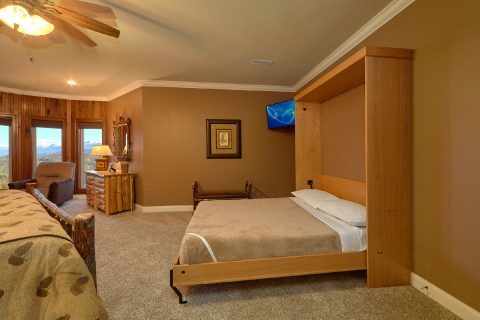 Once you're ready to get some rest on your vacation, you can look forward to staying in the master bedroom on the main level that features a king bed, a walk-in closet, and a wet bar with a wine fridge. 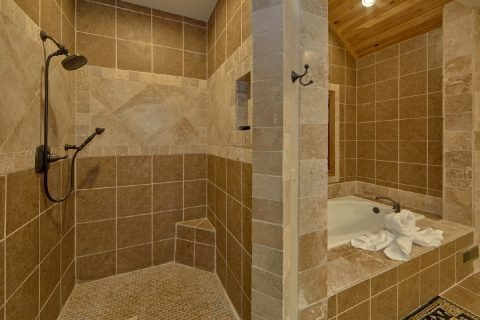 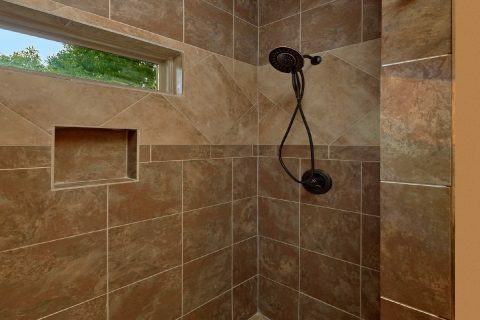 You can also enjoy taking a relaxing dip in privacy in the master bedroom's bathroom with a jacuzzi tub, a shower, and a double vanity. 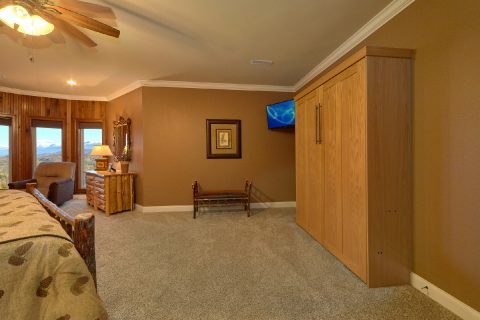 This room also features a queen murphy bed for accommodating extra guests. 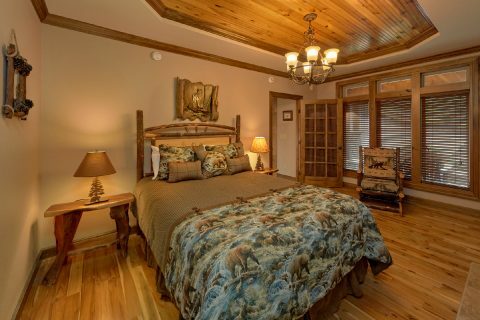 Upstairs, there are two more king-size bedrooms that also each feature a queen murphy bed. 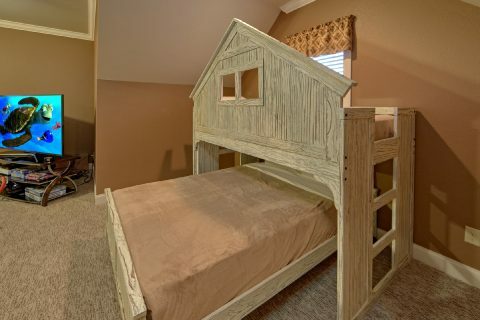 One of these king bedrooms provides a full-size crib and a changing table for infants. 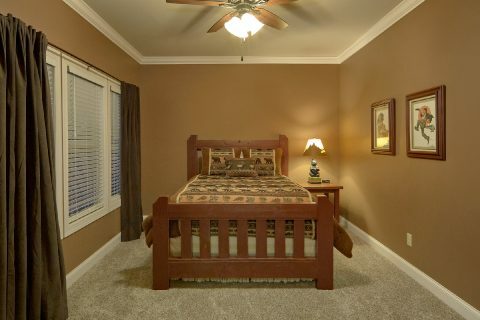 Nearby, you'll find a private bedroom with a queen-size bed. 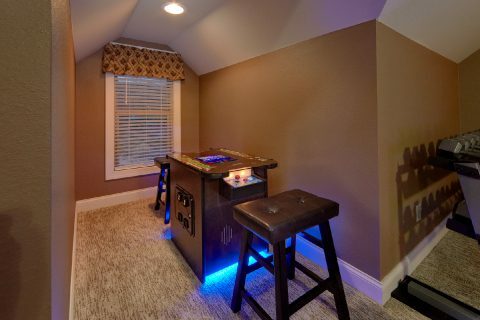 Lastly, the game area features a futon as well as a unique bunk bed with a twin over a full bed. 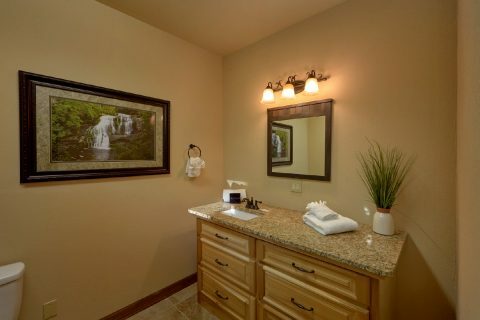 You can also enjoy practical amenities during your stay like WiFi Internet, a washer/dryer, and a 3 car garage with 2 additional refrigerators. 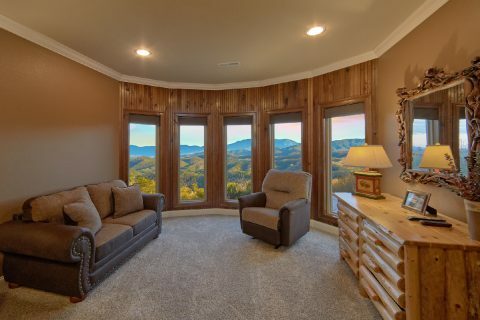 Book "Bluff Mountain Lodge" today with Cabins USA Gatlinburg to earn a special 15% discount on your getaway to the Great Smoky Mountains of Tennessee!